Mix a vibrant urban downtown with a stylish residential district. Stir vigorously. You'll get The Park at City Place. 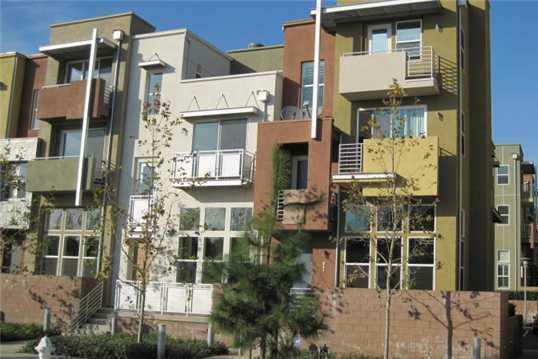 This streetscape of eclectic designer townhomes offers you adaptable floor plans that fit any lifestyle, ample outdoor space, and dining and shopping within steps of your door. It's here at The Park. Decades ago, before suburbs, city dwellers lived in compact flats centered on a common garden or court. Everything was in the neighborhood-restaurants and stores. people crossed paths daily and grew friendships. Spur-of-the-moment barbecues were common. At The Park at City Place, you can go back to that era-with modern quality and technology. Large, versatile townhomes feature all the comforts of today's home design. Verdant central fountain courts offer a lovely, private escape. City Place's planned hub of shops, bistros and amphitheater lies at the end of landscaped walkways. The Park is a throwback to an earlier day... one you'll embrace. With plenty of public, friendly spaces to hang out and chat, chance meetings and spontaneous get-togethers are a delightful part of life in The Park. Craftsmanship, vision and creative design are everywhere in The Park. The geometric shapes and vibrant colors of these townhomes invoke the best of urban creative districts around the world. The materials, from natural stone to gleaming metals, speak volumes about craftsmanship, pride and attention to detail. With four floor plans, The Park offers something to every kind of homebuyer, from the entrepreneur to the entertainer. Build the home theatre you've always wanted, or finally give the kids each their own room while you keep your privacy. Stroll under the trees to the heart of City Place and find a planned area of plazas, fountains, restaurants, coffeehouses and an outside amphitheater. It's a slice of urban heaven here on earth. City Place is the anti-suburb. An innovative urban enclave in the heart of Santa Ana, City Place is built for a new kind of lifestyle: pedestrian-friendly, relaxed, vital and stimulating. Everything you need, from fine dining to entertainment, just a few steps from your door. City Place frees you to work your own way, live at your own pace, create your own style. City Place puts you at the center of the action. The 5, 22 and 55 freeways are minutes away. Westfield Shopping Town MainPlace is across the street. Hospitals and healthcare are nearby. Everything you need is close at hand.